The Toyota 2000GT isn’t just one of the most famous cars of the 1960s… It was the first machine to prove that Japanese manufacturers could build “proper” sports cars. 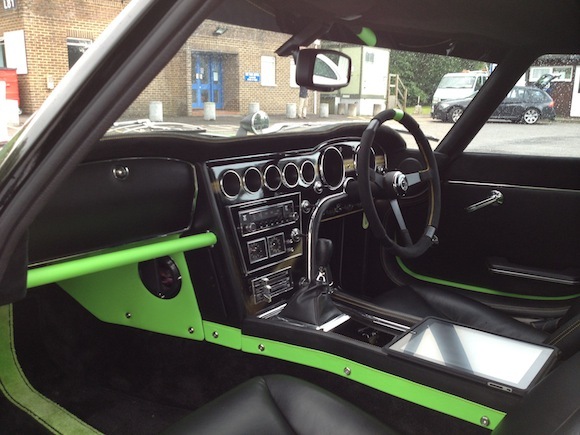 But if you thought the 2000GT was a relic of the past, think again. For the past two years, a small, secretive group of Toyota’s top engineers have been working on bringing one example of the ultra-rare model into the 21st Century. The 2000GT Solar Electric Vehicle, which made its debut at the 2012 Tokyo Auto Salon, mixes svelte 1960s styling with cutting edge technology. As it’s name suggests, it’s powered by a solar charged battery and electric engine. 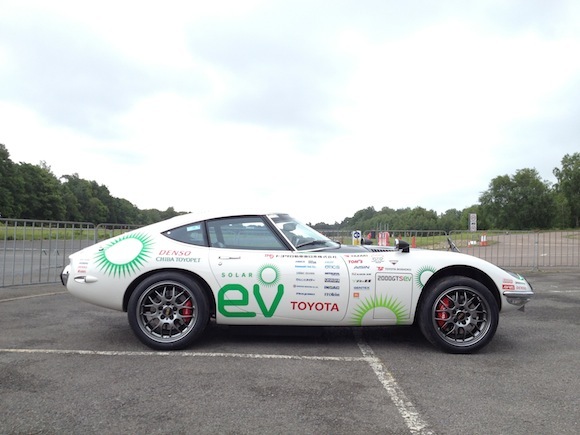 Read more on our drive in the Toyota 2000GT SEV. Why did you decide to create this car? Right now in Japan, automobiles are not popular with young people. Everyone has a minivan, not a sports car, so young people are not enthusiastic about cars. Our first priority for this project is to get young people interested and show that cars can be cool as well as good for the environment, and to inspire them to try making this kind of technology in their future. We thought that using a classic car and showing the development process would be a good way to do that. The styling of the 2000GT is so cool. Even with young people it gets an emotional response, so we decided would be good way to reach out to them. 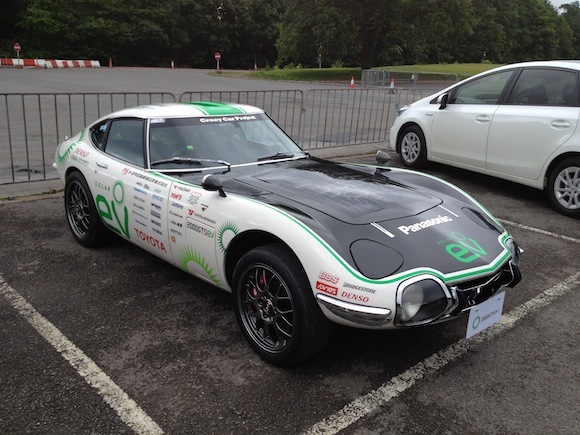 The Toyota 2000GT is a very rare car. How did you find one to work on? The President of Chiba Toyopet [a major dealer network in Japan] had five 2000GTs and my team had already restored one with a petrol engine. He had four more vehicles but these were just stored away, with lots of dust and rust. I asked the president if we could use one. I said ‘It’s better to use this car and try to add new technology than to leave it in storage.’ He agreed with me and let me use it for my plan. What did you do once you found the 2000GT? The underfloor panel was very rusty and had many holes so we totally renewed the floor and had the outer body completely repaired by Kanto Auto Works, which is a body maker in the Toyota Group. We took the engine out and the powertrain, suspension and the frame off – we totally repaired everything. Then we started work on our electric powertrain. Is the electric powertrain new or modified? We took the motor from the Lexus LS600h hybrid as a base to work with, because that is the most powerful hybrid system available in the Toyota Group and we could modify it to EV and create new software to control it. We developed the solar panel for this project. 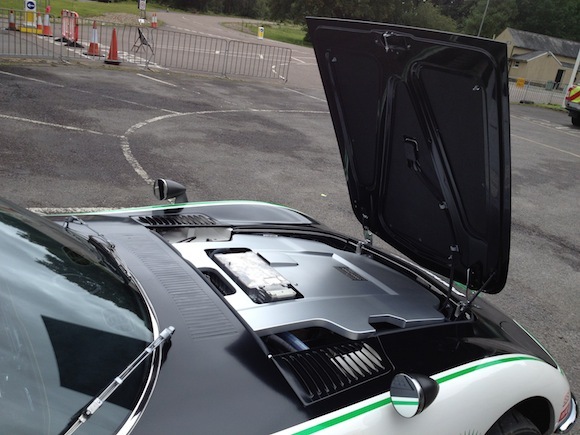 There are many suppliers and lots of types of solar panel but we had to create something a bit different to suit this car. The hardest point is that this is a small car and there is not much room for storage of the battery. At first, we put the battery in the engine but it could only be placed outside the wheelbase of the car, which was bad for weight balance and the centre of gravity. We then moved it back to under the floor and the dashboard, as this was better. What was it like, driving the car for the first time? It was driveable since the end of last year. The first time I drove it was very exciting. Everybody who worked on the car was watching and we were very happy when everything worked well. Now we are introducing small improvements all the time, so each time I drive it there is something I have to pay special attention to. What about this car are you most pleased with? The biggest improvement of this car compared with the original specification is acceleration. The original car reaches 100kph [62mph] in 8.4 seconds, but our car does it in 7.9 seconds. The most important for me, though, was keeping the exterior shape and only making some small changes to the interior. We wanted to keep the flavor of the original car so we used some new materials and changed some dials but kept the layout the same. Also the HALOsonic sound system is important to give the car a feel like a combustion engine and it is useful for pedestrians. How have people in Japan reacted to the car? We gave the car a world premier at the 2012 Tokyo Auto Salon and lots of people were interested. The biggest TV news program in Japan broadcast a five-minute report just for this car, it was quite sensational and mostly everybody liked our idea. Some people didn’t like the idea of taking the engine out of a special, rare car and changing it, but we tried hard to keep the historic flavour and add new technology to show what is possible. Maybe in the future we won’t have petrol anymore, so trying things like this keeps old cars on the road. 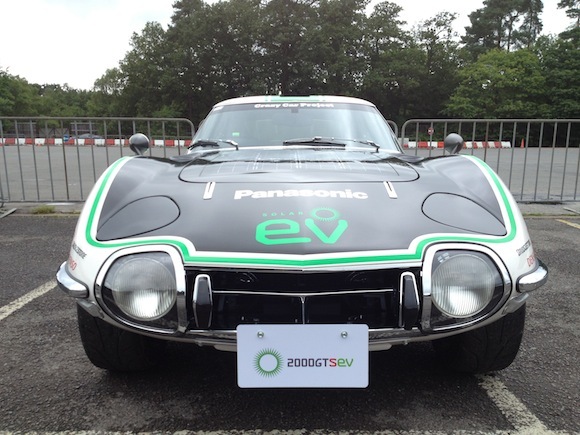 You drove the 2000GT SEV at the Goodwood Festival of Speed. Did you enjoy it? Goodwood was a lot of fun. I have not been before and I liked it, it is very English and the sun was shining when we drove the car. We talked to some people about the car and I was so impressed that some young guys knew the car very well. I didn’t believe they would know what it was. One young guy said this project made him want to be a car engineer and that made me so pleased. This project will be carrying on for a long time. We have plans for this car like adding four-wheel drive, we also plan to enter the 2000GT SEV in a race in Japan for EVs called JEVRA. We are also working to improve the power and the steering. Next time we will use a different model and a different type of technology to show our future thinking. We do not want to do the same thing again; it is better to try new things. What do you drive every day? The car I drive now is a Toyota GT86. I bought it in April and we are working on preparing it for endurance racing now. It is a lot of fun to drive and has a great spirit like 2000GT. Please carmakers over the whole world! Come back to your senses. Cars have changed and evolved to incredible things. But sometimes, it’s good to look back. The 2000GT is the most beautiful car ever produced by Toyota. Nowadays cars have no character, emotion and beautiful styling. I would like to see the 2000GT again, a Datsun 240Z, the ferrari Daytona, Mercedes SL and all those lost Britisch cars. I am absolutely convinced if Toyota decided to make these 2000GT again, as they were back than with modern technique, everybody would want one. Just a nice 6 in-line like back in the day. I would sell my organs to have one of them.